Having a slow Friday afternoon? If so, you should make the time pass by reading the May issue of Wood News! This month we’ve got some great entries in our Show Us Your Shop, Show Us Your Woodworking and Show Us Your Carving columns. Matthew Curry’s Bainbridge Island workshop will inspire you to start checking the real estate listings for something like this for yourself! Tyler Stokes is only 18 years old and is crafting beautiful woodworking pieces, and Richard Cheek displays a very diverse range of carving skill, including a replica of his own left hand! J. Norman Reid unlocks the mystery of hand planes and how to incorporate them into your woodworking – if you’ve ever been unsure about using hand tools, definitely give his article a read! Steven Johnson, our Down to Earth Woodworker, has an informative review of the Festool CT Boom Arm Set, as well as a trick for cutting dados with your Festool router. Then he has some fun with a couple pieces about how to get through a discount big box store unscathed (think woodworking) and the development of a line of specialized woodworking shoes. We’ve also got some new video product tours by Morton, and much more. 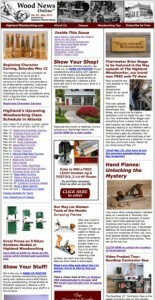 Go take a look now, and have a great woodworking-filled weekend! The Plane Facts: A couple of great scraper planes The Highland Woodworker: A New Episode Featuring Brian Boggs and Ron Brese!